FROM THE HEART ART KITS were created in HANDMAKERY FROM THE HEART: making + creating to give with 6 – 9 year olds as a project to learn about making to give. 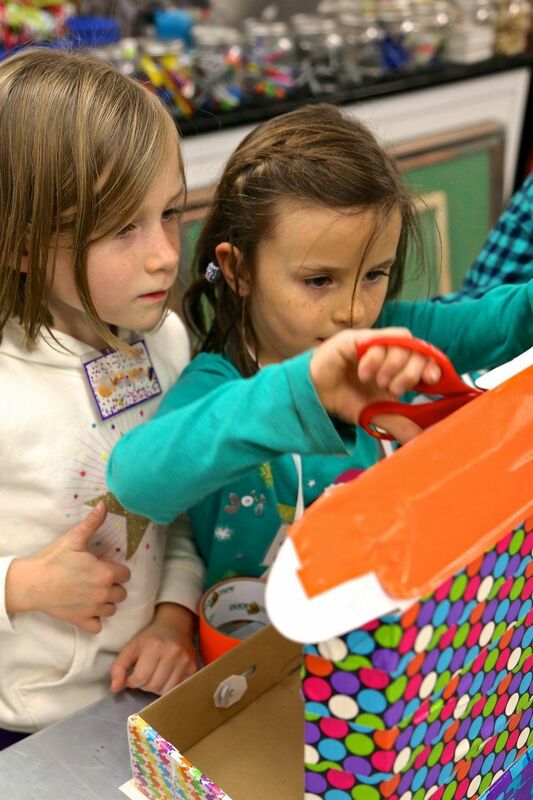 They were then gifted to local children in need, through our local Angel Tree Program over the holiday season! 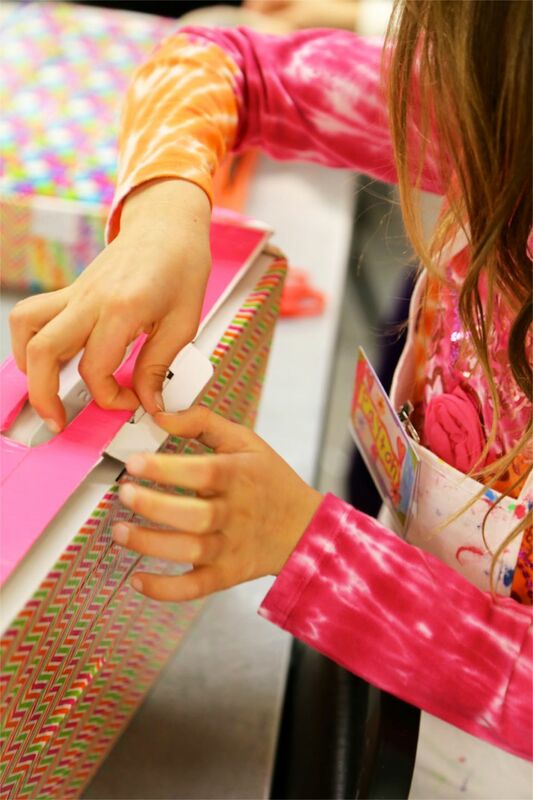 Each artist designed a box and shopped for a collection of art supplies with their families, to create their very own + personalized, FROM THE HEART ART KIT! You could create your kit to gift a loved-one this Valentine’s Day to show your love + appreciation. It’s a gift from the heart that inspires daily + yearlong C-R-E-A-T-I-V-I-T-Y and M-A-K-I-N-G! 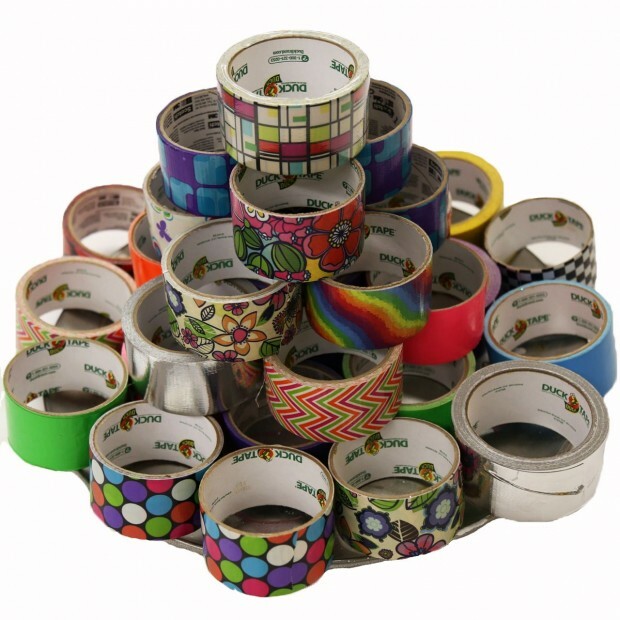 Duct tape or Duck Brand Tape in various colors + patterns. 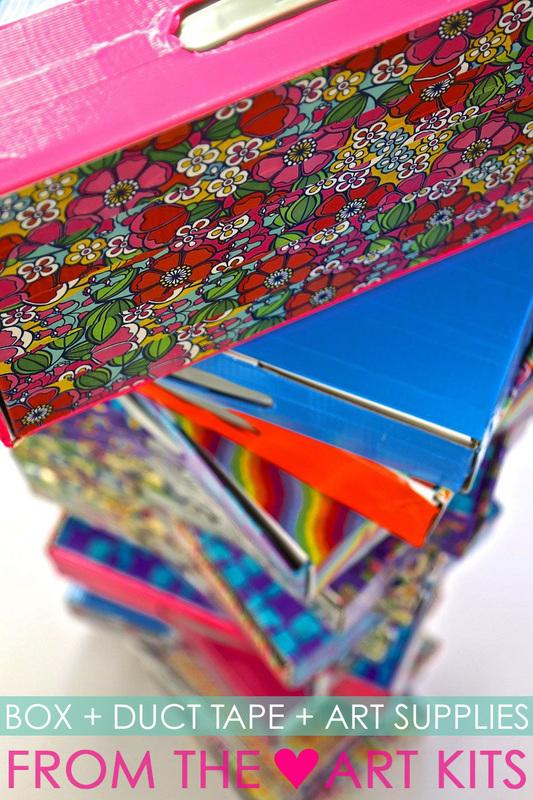 Learn more here about duct vs duck tape! First decide on your color scheme and overall design plan. 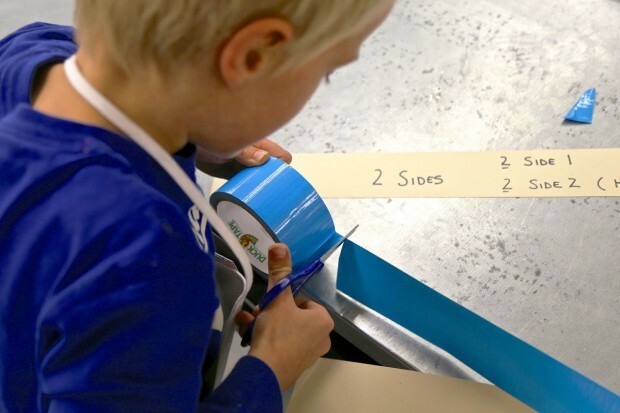 Move into cutting duct tape strips using a lot of muscle power to stretch the tape. Cut using the inner part of the scissors, as this surface is the sharpest. Remember to hold your tape tight before cutting and be sure it doesn’t twist. 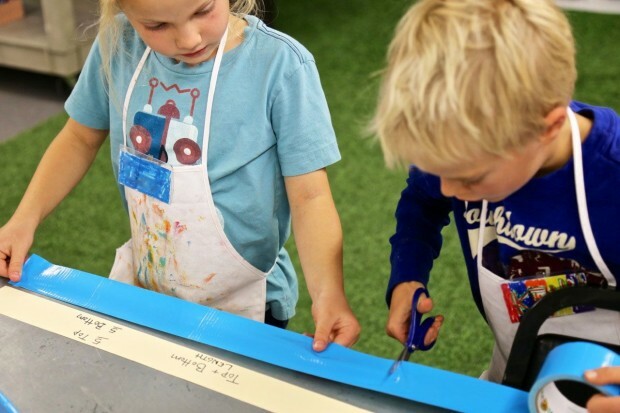 We used a simple handmade paper guide to measure our length for strips, as there were two lengths and this method was much easier for this age group than measuring with a ruler. 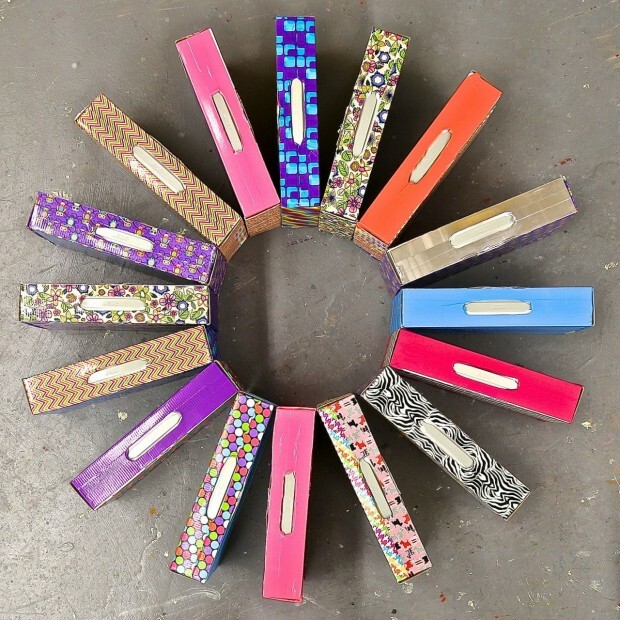 Each artist teamed with a partner for the entire duct tape process, which made the cutting + lining up + taping manageable and much more fun! There was lots of excitement over tape selection as we discovered lots of solid + patterned duct tapes in our duct tape quest! 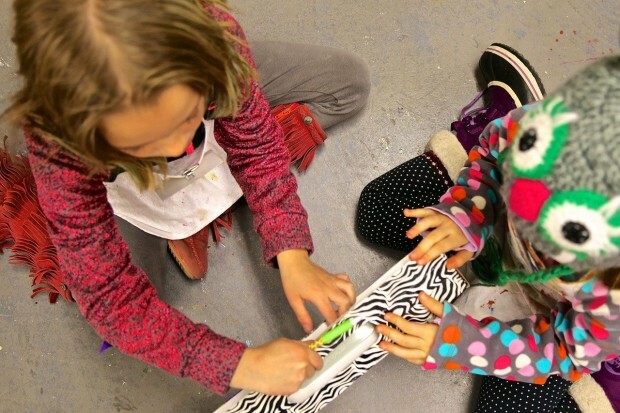 Creating their own color schemes + patterns was such an expressive piece to this process! A each artist became a product designer and loved every minute of it! I definitely got the feeling there would be much more experimentation with duct tape in the future with these individuals- they LOVED working with duct tape, especially because it’s so vibrant and beautiful! 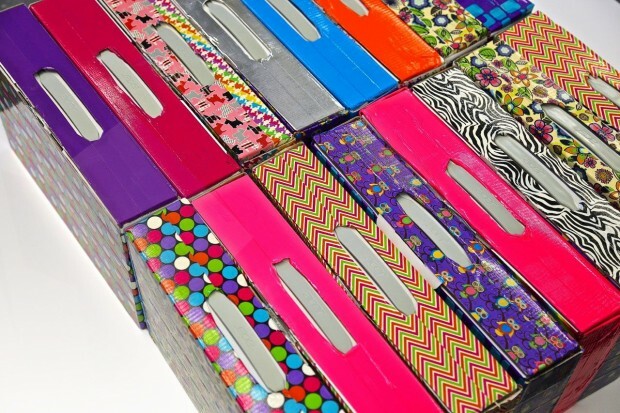 any additional art supply you and your child might want to add! 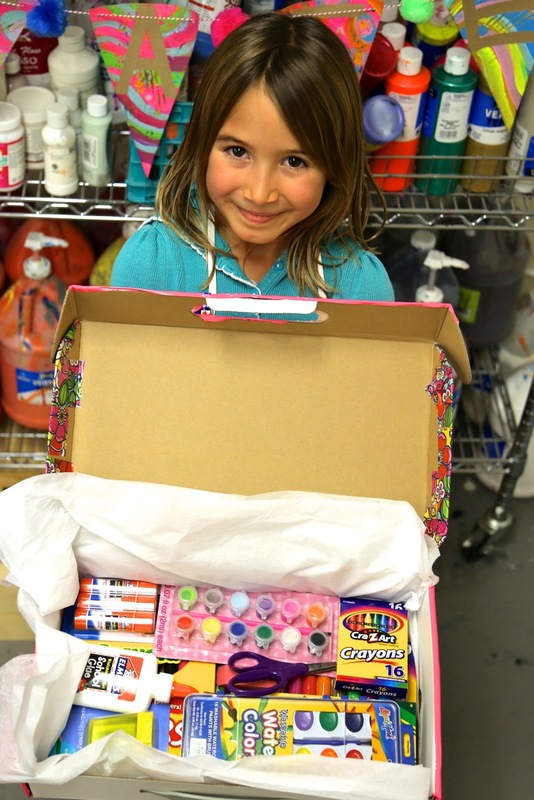 Each artist in our workshop had our general art supply list and went shopping with their families to fill their box to create a very personalized FROM THE HEART ART KIT! Two+Two bags are always a lovely + local addition! two+two designs chic reusable bags and bowl covers that are food-safe + eco-friendly. Based outside of Aspen, Colorado this young company is run by two creative Moms with a passion for style, sewing, Mother Earth, and doing what’s best (and cutest) for their little ones. two+two products keep goods + food fresh and uncontaminated with a proprietary lining that is free of lead, BPA and phthalates. 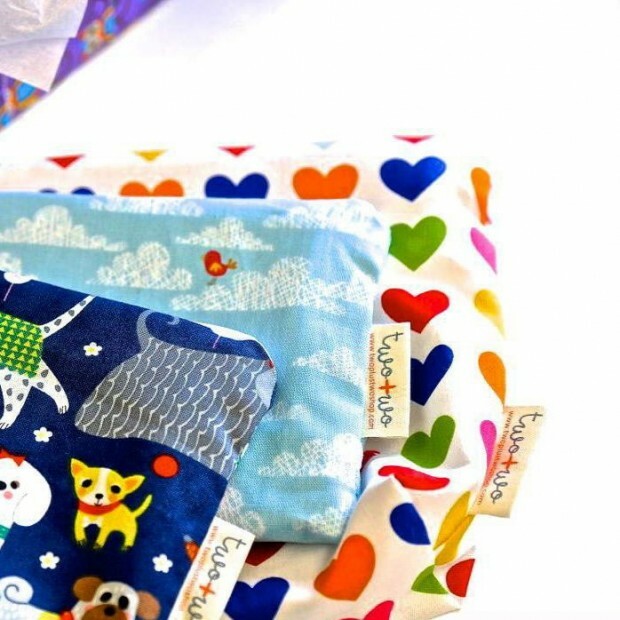 The various sizes of eco-friendly reusable bags accommodate any and all packing, organizing and traveling needs. We love having the two+two families “two children” part of HANDMAKERY! A proud + beaming artist just after she had filled her FROM THE HEART ART KIT and it was ready to travel to a child wishing for new art supplies! 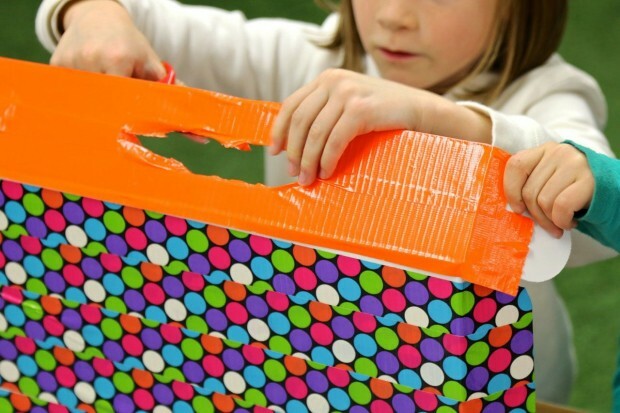 Each box was taken to our local Angel Tree Program, where boxes were added into gift bags and gifted! 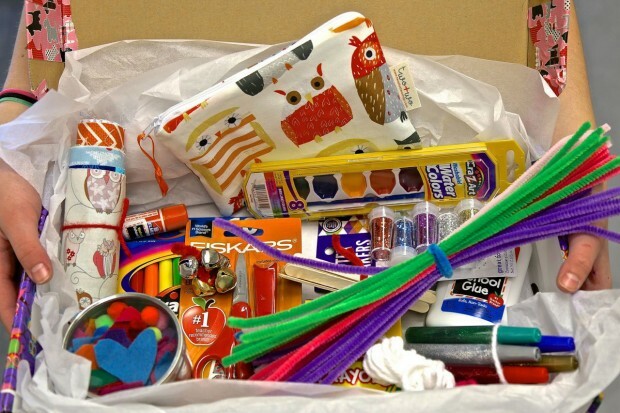 Thank you to the seventeen HANDMAKERY Families that donated art supplies to gift and a BIG thank you to each artist that gave from the heart, something special that they had created on their own! Also a huge thank you to Cresta Stewart and the Carbondale Rotary Club for heading-up + organizing + dedicating tons of time and energy to this fabulous project, that benefited so many local children! Our Winter Vintage Cottages were created in our workshop HANDMAKERY FROM THE HEART: making + creating to give with 6 – 9 year olds! The Winter Vintage Cottage was our third project in a six-week session! The children absolutely LOVED working on these! 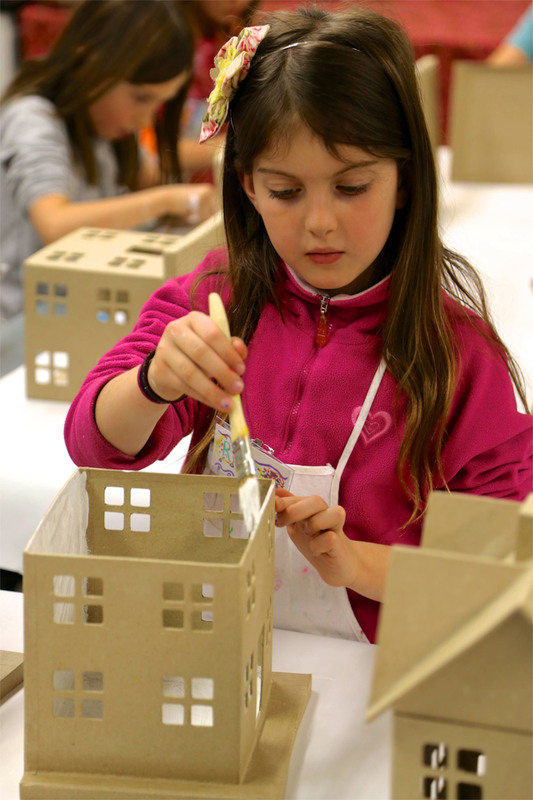 Most children created their cottage as special gifts for a loved one! We were excited that the cottage could light up with a flameless tea light and be used for a nightlight! With all the windows it has fabulous ambiance! Our biggest challenge was finding enough of these fabulous little houses, but with friends and family searching across two states, we had just enough for our seventeen HANDMAKERY artists! Thank goodness for family and friends that searched high and low, making room in their travels for these delightful pieces to inspire! Here is a little gift to welcome your NEW YEAR focused on making + creating + crafting + exploring creativity + being hands-on + celebrating mixed-media! 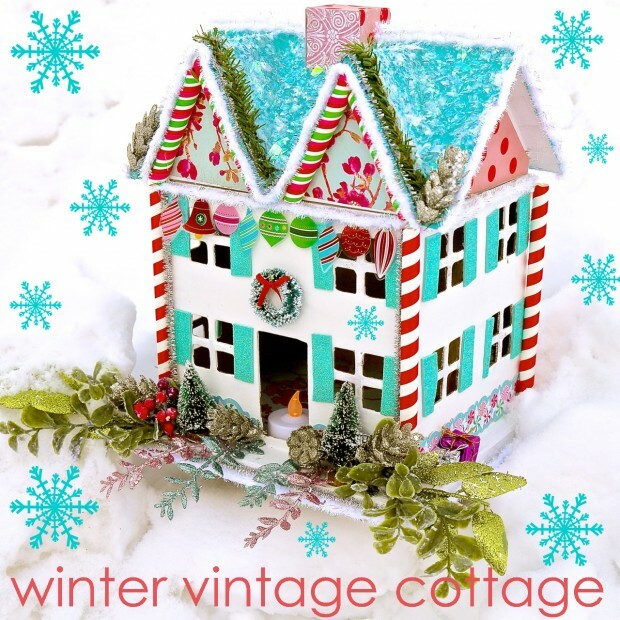 Enjoy our DIY to guide and inspire you in making your own Winter Vintage Cottage!